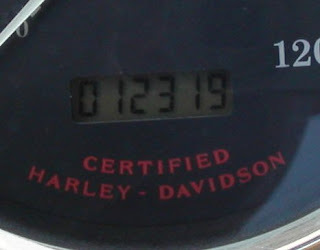 One of the reasons for getting a Harley-Davidson was to fulfill the dream of making a very long road trip. 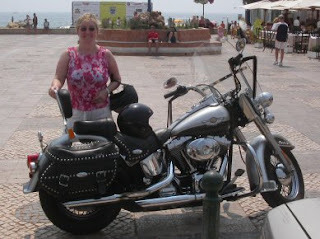 In the summer of 2005, I decided that I would ride my Heritage Softail Classic to our family holiday destination at Vilar do Golf which is near Almancil on the Algarve in Portugal. Roma and the girls took the easy option (by air) - the plan was that I would meet them there. I set off from Blackrock, but not without a last minute scare. On the morning of departure, the gear lever on my bike started to get stuck. Panic stricken, I called the guys at Harley-Davidson Dublin who got me to take the bike in to their workshop. Upon arrival, Graham takes one look and says that all it needs is grease - moments later, I am on my way with a newly greased gear lever. First stop was at St Helen's in Rosslare to meet my cousin Declan Quinn - he has a holiday home there. I got a great welcome and the bike was the centre of attention. After a satisfying steak cooked on his barbecue by Declan, I set off for the nearby Rosslare ferry to Roscoff in France. The ferry trip was uneventful. I started reading "Long Way Around" by Ewan McGregor and Charlie Boorman for inspiration for the long road ahead (see my review of this book at Amazon). I had my route planned out well - the AA web site gave me all I needed. I had maps too - but not possible to read these while riding. These were examined at the regular stops at petrol stations (approx every 160 miles) in great detail. My first wrong turn was just after leaving the ferry in Roscoff at a roundabout (I was to have several problems with roundabouts). In any event, navigating mostly by the sun, I reached the coastal route down through France that I had planned. My destination at the end of this first day was a campsite that my brother Joe and his family were staying at. I had a very pleasant ride down. Once I hit the dual carriageways, I was very impressed by the discipline of the French in staying in the right lane. I found adapting to riding on the "wrong" side of the road quite easy. I did pull up along a 1960's style Volkswagen van. While I was admiring the paint work, I almost got run over by a car that came from nowhere behind me - an early warning to pay attention to the road. I thought I was lost when I got to the area where Joe's campsite was. I pulled over to check my maps and happen to park right beside a local map at a tourist information stand - lucky. I figured I was close to that camp site and headed off. I stopped at the entrance and called Joe who came out to meet me - good to see him after a long tiring ride. We rode into his berth attracting the attention of everyone as we passed by. Straight away Joe pulls a litre bottle of very cold Heineken from the fridge - ahhhhhhhh! After another barbecue we went to the Camp Centre for a few brandies - a few too many. I kept the brandy glasses as souvenirs! Next morning, I had a light breakfast with Joe - two mugs of tea cured me (almost) of previous evening's brandy. Miriam got up to say goodbye, but was not feeling the best and headed back to bed for a post-brandy kip. We said our goodbyes and I set off for Spain. Joe and I exchanged many text messages during the trips - a welcome link with family. Leaving France you see the western side of the Pyrennees, some of the roads here were very twisty, so the pace was not great. Northern Spain is lovely - lots of trees and greenery. Lots of bikers on the roads too - most signal to me and I signal back in a feeling of brotherly connections with my fellow bikers. Some bikers who pass me stick out a leg in the same way as a dog peeing against a lamp post would. None of these are Harley riders and I assume they are insulting me in some way. Destination today was Valladolid. I almost ran into the back of a car which slowed in front of me coming off a roundabout. I skidded, but managed to avoid hitting the car. I did wonder, what the hell I would do if I burst open my front tyre. I resolved to be even more careful. At a petrol station in Placencia, I accidently wiped my windscreen with the harder side of a sponge and scratched it badly right in my eye line. I had little trouble finding the street where my hotel was - the NH Ciudad de Valladolid, but as it is set back a little bit from the road I passed it three times before I spotted it. After registering, I wandered about Valladolid and had tapas for dinner. I called Roma who was doing some last minute packing before leaving for the airport tomorrow. Exhausted, I went to bed early and slept like a brandy hung-over biker who had riden over 700 miles in one day. Next morning, I once again took a wrong turn at a roundabout. I stopped to ask a young person for directions, but surprisingly she had no Engish and did not understand my requests. Further on, I met an older man, he too did not have Engish, but he did understand what I was looking for and with use of hand signs he directed me back on the correct route. Almost an hour lost on what was to be a frustrating day. Up to now, I had been riding mostly on motorways and dual carriage-ways - this ended in central Spain and I made a lot slower progress. I also had to go through towns without by-passes, this in the middle of a heat wave that was badly affecting Spain and Portugal. I saw many lakes almost dry, though thankfully none of the forest fires that were reportedly raging in the region. I was suffering in the heat. At one petrol station I took off my jacket and found that I was soaked in sweat. I could not put my jacket back on and decided to ride the rest of the way in my tee-shirt - it was also approaching evening and it was getting cooler as I rode on southwards into Portugal. Fantastic roads in Portugal, though there were a lot of vehicles broken down at the side of the road - perhaps as a result of the heat. I reached Almancil without further problem, but in the town centre I took a wrong turn. I asked for directions and got sent to Faro! I called Roma who by now was worried why I had not arrived - she and the girls were well settled into the villa. I asked for directions again and finally arrived at Vilar do Golf - very tired, dehydrated, and frustrated. I had arrived. I used the bike quite a bit on the holiday. Roma and I did made a trip to Carvoeiro where we had been on holiday a few years ago. We did not get to have lunch in the restaurant we aimed for as it was closed - instead we had a nice lunch in the town square. After two weeks of holiday in Vilar do Golf it was time to start the journey home - I left Roma and the girls at their bus for Faro airport. They would be home before I was half-way to Valladolid. I touched 100 mph (for the first time ever) on the Portugese motorway briefly - a lot of vibration and a lot of noise (even though I was wearing ear-plugs). Once inside Spain I stopped for tapas in the filthiest bar I had ever been in beside a petrol station. In the petrol station, the attendant wanted to know everything about my bike - including how much I paid for it. The tapas were good. I reached Valladolid without problem and found the same hotel as I had stayed at on the way down. It was here that I got a dreadful pain in the back picking up my shoes that was to plague me for the rest of the trip. A nasty end to a good day's riding. Aching badly, I set out the next morning for Poitiers in France - this was to be my longest ride on any day of my trip. I could just about ride, but the roads were getting better and the riding was easy enough. I had to stop in Northern Spain to put on my wet gear - the shower only lastest a minute, it was the only time I had rain. I stopped again a few minutes later to take the wet gear off. It was much cooler than the trip down and I didn't mind the long ride so much. I made it to Poitiers and found luckily my hotel. The hotel had a Harley Davidson Road King as a decoration in the lobby - a welcome sight. I took a hot bath to try to overcome my back pain. Afterwards I went for a walk to find a place to eat - it took quite some time, but I eventually opted for a Chinese meal. I was the only person in the restaurant! I went to bed early hoping to sleep off my back pain. Feeling a bit better, but still doing everything in slow motion, I had breakfast and set out for the ferry in Cherbourg. I was a bit later than I had hoped, but I expected to make up the lost time on the road. After Le Mans, the road is no longer motorway, so the pace slowed again. Before I left the motorway I once again put the bike up to 100 mph - this time for longer as I couldn't resist it on an almost empty motorway road! Go me! Not being on a motorway meant that I was now concerned about petrol - I started to ride economically. Despite passing a through a lot of towns I did not come across any petrol stations. Beginning to panic, my tripmeter registered 160 miles since the last fill, then 170, 180, and at 186 miles I had to switch to the reserve tank. Usually I get about 165 miles or so on a normal tank of petrol, so I was lucky to get 186. I pulled into a town and eventually found an unmanned petrol station - but my credit card would not work - I had to keep going to the next town. Fortunately, there was a petrol station in the next village and I filled up for the last time in France. I had lost a lot of time going slowly, and looking for petrol. Now I was against the clock for the ferry - I rode as hard and fast as I could and made the ferry with about 20 minutes to spare. I passed by Bayeaux (I would loved to have stopped to see the tapestry), lots of signs for castles and intersting places, war cemetaries, and the 1944 D-Day landing beaches. I passed by them all. I had also planned to pick up a nice bottle of wine or two in a warehouse to bring home, but no time for this either. Once on the ferry, I could relax. I bought a bottle of cheap wine, bread and cheese, and sat out in the evening sun to savour the last decent bit of sunshine I was going to get for another year. I was woken in the middle of the night by a banging door as the crossing past Cornwall was quite rough. Rosslare - back in Ireland at last. I called Joe from the ferry to thank him for all the texts over the past three weeks. I called into Mum and Dad in Carnew on the way back and got a great welcome. Needless to say, the bike trip was the main topic of conversation. I arrived back in Dublin and after 3,210 miles (5, 136 km) was home at last. Great to see Roma and the girls again and I was proud of myself having completed such a long journey. I felt a great attachment to my Harley - we had been on such an adventure together. I have now done the long bike trip that every biker feels that they want to do. Would I do the same trip again? No - I've riden a bike to Portugal and back - once is enough, next time I'll take the plane. Also, I tried to do too much each day - effectly, I did 500+ miles each day for three days on the way down - and the same on the way back. I missed so much - if I was to do a similar trip again, I would take 6-7 days to do the same distance and do just 250 miles or so each day. That way I could see more. For example, I passed through Salamanca in Spain in both directions -only on the way back did I see the massive cathedral up on a hill that dominates Salamanca - how did I miss this on the way down. What else did I miss? I passed by a lot of things, but saw very little besides the road. I should have brought my camera to record more of the trip - I did take some photos with my new mobile phone, but somehow managed to lose these before trying to get them on my computer. I would like to go to the South of France on the bike - probably take two days to cross the country. I'd really fancy having my bike on the Cote d'Azur. In France sticking your right leg out on your bike means "thank you".